A great feature of the SL event was the participant registration. Those that registered early were put on the Eduserv Island attendance list, so there was no need to worry about losing your sit in case you had to log out and log in back to solve technical issues. Definitely a great idea! We started the symposium with a pretty elementary presentation of Second Life: what Second Life is and what it can be used for (no mention of casinos though ;) ). Although Jim isn’t an educator, I think he made a good point when presenting the skills needed to create content in Second Life. He pointed out that the skills that people need to create virtual goods aren’t useful just in Second Life, but are much broader digital skills. Still, this presentation was quite business centric, and “branding” was a word we heard quite a few times during this presentation. The symposium continued with another business-related presentation by IBM. IBM would like to take part in building the 3D internet in which different virtual worlds and formats could connect through standards, and at this moment they are experimenting with different virtual worlds. First, Roo presented how IBM uses Second Life. They have some interesting projects in SL (Australian Open project, Greater IBM Connection etc. ), and they also use SL to host virtual meetings (also informal) a couple of times a week, during which people can meet and talk, and create a better digital social and spatial presence. They also see great possibilities for organizing training, medical simulations, rehearsals, conference streaming, doing research and many other areas. However, they don’t want to use SL to talk about confidential informations, so they’ve decided to experiment with their own metaverse project, which can be hosted on own their own servers, behind their firewall and can present some sort of 3D intranet and a safe business environment, in which they can also host confidential meetings. I think that might be the future of many enterprises - building a presence in a public virtual world and at the same time having a private virtual world for internal uses. I think schools could do the same - have private and safe classrooms on their own servers, but at the same time present their achievements to the world in public spaces. For more info about Roo’s presentation see his post at eightbar. During this presentation we heard the reasons for building a SL presence from a more educational point of view. 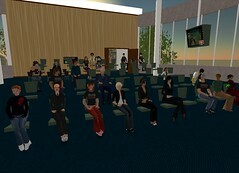 The Edinburgh University chose to enter Second Life because it is cross-platform, because it is not a game, but still quite playful, and because several educational institutions already had a SL presence. During the presentation Hamish pointed out some important things they considered while building Holyrood Park (their SL space): they wanted to have students talking and meeting outside, and also they wanted to get away from classical spaces and artifacts that are used in traditional classrooms. I think these are very good points, and I really think Holyrood Park is a great educational space that makes visitors feel really comfortable. Also, Hamish presented the benefits of using SL for their university (presence in an important media space, opportunities for learning, teaching, research and development), pointed out some of the educational potential of SL (new learning spaces, active learning, digital identity and presence,…) and also some issues that the unversity has to deal with (legal issues, systems requirements, accessibility,…). The next presentation was about the Second Nature island, which is owned by Nature Publishing Group and that has a lot of great scientific tools and simulations to offer. NPG sees Second Life as a great tool for science education, scientific research, and as a communication tool (to host scientific meetings, events, and conferences). Joanna presented some of the existing content on Second Nature island, which I first visited after her presentation. Second Nature is definitely an interesting place in SL, and I certainly can’t wait to see more content added! Next, Gilly presented the Leicester University Second Environment Advanced Learning (SEAL) project and their University presence in SL. And the final presentation of the day saw Stephen Downes playing the techno sceptic and (in my view) presenting Second Life more rationally. Stephen reminded us that SL is a game (“and it’s ok!”), and he presented some of the SL current issues: the fact that a company owns Second Life, the problems of scalability, the fact that SL heavily relays on its economy, private propriety etc. Stephen made an excellent point by saying that SL “taps into a latent conservatism” - SL feels very safe and it is very tempting to do the old things in a new space using the old way. SL isn’t like Web 2.0, and it should be: in Stephen’s words it should be distributed, open source, non commercial, diverse, democratic, and a place to create our own identity for free - more like the web we know and love. I certainly agree with Stephen: SL in its present form is not the future for education (something I’ve already pointed out in one of my previous posts).